I had just recovered from a two-month near-total lay-off brought about by acute ITB syndrome (that’s runner’s knee) when I ruptured the plantar fascia in my right foot. I talked about this in an earlier post. We were due to hold Dumb Run IV last weekend — the 4th incarnation of the League‘s annual nocturnal coast to coast century ride. First one of our regulars pulled out, citing time trial commitments, the cheek of it. 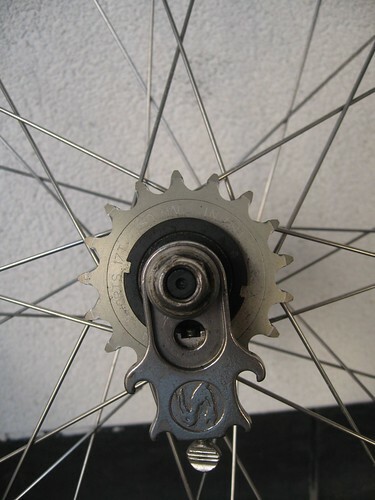 Then last year’s hero of the 86″ gear had a work emergency and had to pull out as well. I’d been in two minds as to whether I was fit for it and, with us down to three (because no one has heard from Tom in ages), we decided to cancel. This was a bloody shame, because I started on the weather gods early this year, and it was damn-near perfect. Dumb Run IV shall henceforth be known as the Dumb Run of which we do not speak. Obviously in a full-on grump over last year’s success, the ride acted backwards in time to cause emergencies and injuries to stop us. That’s 3-1 to the Dumb Run, but are we broken? NO. Are we defeated? NO WAY. Dumb Run V has been set for SATURDAY, 18TH JUNE 2011, 8PM DUMBARTON CASTLE. No excuses. Sadly my ongoing injury means I won’t be competing in the Galway Triathlon this year, either. It occurred to me today that I’ve now been off proper training and racing for getting on for six months as a result of injury, which explains my foul temper, irritability and moodiness. Lack of exercise is affecting me the same way as really bad PMT, only with the additional joys of stiffening joints and loss of fitness. I’m now faced with the awful decision of whether to enter Bala and hope for the best; or to scratch the rest of the season on the assumption that my foot will get better in time for next year, but not if I succumb to the temptation to train on it. While the latter is probably more sensible, I’m finding that my motivation to take part in the sport at all is waning the longer I’m forced to sit it out. How long does the PF take to heal anyway, FFS? IT HAS BEEN 2 MONTHS ALREADY. The architecture of our apartment block is such that it’s a veritable wind tunnel out there in anything more than a Force 1 on the Beaufort scale. As today is relatively still and bright I decided to wash the bikes. If it were anything other than a wind tunnel out there, I’d have been doing something much more fun. Washing any more than two bikes at any given time is just awful. Today Shackleton (the commuter fixed-gear Il Pompino) and Peregrine (the race bike) were top of the list. Shackleton because he is out nearly every day and Peregrine because it’s the end of the season and he hasn’t had a wash since before the Galway Tri. People accuse me of mollycoddling my bikes. So clean are they I have heard the sentiment expressed that I don’t ride them. Well, the reason I mollycoddle them is not just because I love them as much as Marek loves Mr Schitzer but because it enables me to identify maintenance issues earlier rather than later. 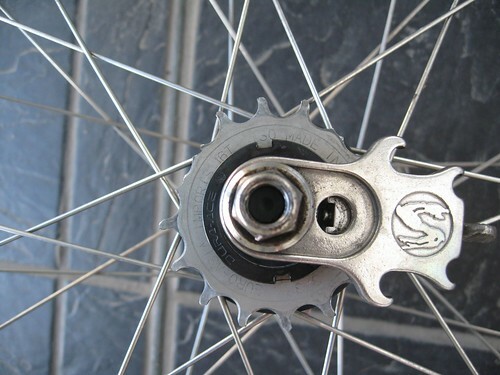 Both pictures show an EAI alloy sprocket. The top one should have 16 teeth. It has 13 teeth because three of them have snapped off. The rest of the teeth are a bit — understatement — worn. It has done 17000km, so this is not surprising. For comparison’s sake, the bottom photo shows a 17t sprocket that resides on the flip side of my hub and has been used once, to my recollection. I confess to a bit of a stomach lurch when I saw that. Doing 160rpm down a hill is not the time for the chain to leap off and jam because there are insufficient teeth to hold it on the sprocket, and 160rpm is by no means unusual for me on my commute, especially on the way home. That could have ended in tears. Not to mention experimental use of the face as an additional ablative braking surface. However, it didn’t, and because I mollycoddle my bikes I discovered the failure before it caused serious damage. An order has been placed with Will at HubJub and in the meantime I shall fetch Blackbird out from her spot in the corner. Peregrine, incidentally, is now exceptionally shiny. Despite having been part of my stable for around 6 years, he continues to take my breath away. People who don’t love bicycles don’t know what they are missing.